If you are interested in learning the art of Taxidermy we can help you reach your goal! Whether you just want to do it for friends and family or open a full-fledged taxidermy studio! We have been doing taxidermy for the past 35 years and are well versed in all fields and specimens. 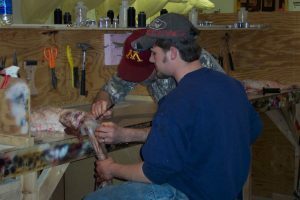 We have been teaching for the past 13 years and some of our students have the busiest studios in the central MN area after they completed training in our taxidermy school. The reason is because they put out the best quality specimens and they started it all right here! We have been teaching the most up to date methods used in the studios for the last 13 years and have now made the experience more personal. Our current class is based on one or 2 students at a time. This allows for a more laid-back environment and more in-depth instructions. We will also have two locations available. Our Rice location is ready to go and we are currently building our Wadena location and should have it ready by the summer of 2018!! The Wadena location is roughly an hour’s drive from Fargo, Motley, Park Rapids, Detroit Lakes areas. See map on website to locate us! We will teach you the methods of taxidermy on the following specimens Whitetail Deer, Fish, Birds, and Small Game. The most mounted animals in the industry nationwide! We also will talk you through licensing within YOUR state to make sure you are compliant with the laws! Cover learning tools and further education once you have completed the course. Full list of tools needed to get your studio up and running. We also supply you with an airbrush which is needed on all specimens that are mounted. We always have and always will provide ALL specimens and forms to our students when attending our course. You may provide your own but if you don’t have any good quality critters, we have that covered. You will receive 2 deer shoulder mounts (most students bring in their own antlers as it makes the mount more personnel), 4 fish, 2 birds, and one life size small game. We take you to the tannery located in Rice not far from the shop that we use on tanning all our hides and capes. This gives you some insight into the tanning process but does not teach you the tanning methods. We do offer tanning classes and this would be listed under Additional Classes on the bottom of this page. We do not have state funding for tuition. Tuition is $6500.00. Again, we provide the students with EVERYTHING they will need in order to attend. Scheduling of classes will be done on an individual basis. Since the classes are one on one, our schedule can be conformed to fit YOUR needs. We have done this in the past and it works very well. We get all the projects completed at a pace that fits with the individual student’s needs. No other school offers this. Hours per class will vary but expect up to 4 hours a day. Time of the day class will be held will be set up with student. As this is set up around students wishes we can run class anytime of the day being somewhat reasonable on the times. If weekends are the only days available to the student we can run them on the weekends also. Generally, figure about 30 days to complete the course. We do NOT offer classes in the fall as our studio gets too busy with our customers specimens coming in. Give a look at our instructor’s work page and see for yourself that you will be taught by those who know what they are doing! For those of you looking for a more structured class schedule we can fill your needs as well. There will be two classes given in a year class one will begin on the first Monday in April class two will begin the first Monday in July both will run for roughly 6 weeks, 4 days a week Monday – Thursday. Times of the day will be adjustable according to the individual needs of the student. Some students do not want to learn all aspects of taxidermy and only want to learn one or two species. We can and do break it down to individual subjects. Below is the tuition breakdown for those classes. Again we provide ALL material and specimens. WHITETAIL DEER…$2500.00 – Estimated hours for Deer Class (2 deer) 22-30 hours. Life-size turkeys. This class tuition will run $1300.00 and again we will provide you with specimen. Turkeys are a different breed of bird to deal with and therefore we offer a separate class for them. A good turkey mount now a day brings in roughly a 1000.00 to a qualified taxidermist. Telephone 320-393-2825 call or text. Taxidermy School Is Located in Central Minnesota.